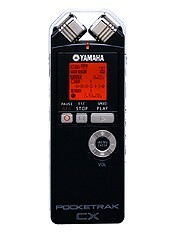 Yamaha has seemed to taste the market for portable recorders, after launching the Pocketrak 2G earlier in the year. However, they have stepped up their performance with the Pocketrak CX, which is more music-friendly. This new model has many features that are the same as the Pocketrak 2G, as it is very slim and small, and it weighs nearly nothing as well, at less than 100 grams. However, the Pocketrak CX also benefits from a high-sensitivity 90 degree X/Y microphone, which promises a suitable portable device for recording music live. Another thing that Yamaha added to this new device is the option of expanding the memory allowance of the Pocketrak CX with a microSD card. However, is does already come with a card that can hold 2GB. The Pocketrak CX can record at a quality of 16-bit/44.1kHz, as well as store WAV and MP3 formatted files. It also has a mic/line input that allows files to be transferred from a computer through USB. The supplied software, Cubase AI4, can then be used to edit the files. Other features of the new Pocketrak CX include: an onboard speaker and stand adapter. The battery life allows as many as 40 hours of recording and play-back continuously. This devise really becomes a powerful tool that musicians will love. The Pocketrak CX carries on the name of the Pocketrak 2G, except it is even better. This new device is available at authorized Yamaha dealers for $499 MSRP.